We provide educational solutions worldwide for professionals interested in capability development, in a fast-paced business environment. Our learning philosophy combines learning transfer with assessment, providing you with insightful lectures, real-world case studies, interactive exercises, practical assignments and rigorous certification exams. Complete the online certification program and get your certificate, which will validate the expertise and skills necessary to drive performance excellence! Attend different training courses, from a wide variety of domains, either as modules of the online certification programs or independent courses on different performance related topics! Enhance your knowledge and discover solutions to meet your organization’s needs! Participate in one-hour presentations, meant to provide you with knowledge and best practices exploring ultimate performance related topics! Our skillful trainers will answer your questions and address your needs on numerous performance related topics. Focused on exploring all facets of performance, The KPI Institute performs research on 12 different practice domains, ranging from Strategy and KPIs to Employee Performance, and from Customer Service to Innovation Performance. The insights and best practices acquired through research encompass both practitioner and academic perspectives and represent the core of both our on-site and online educational programs. TKI eLearning is a platform that provides access to comprehensive educational materials, which complement and enhance the educational value of the on-site training courses. Our ambition is to instantly provide worldwide professionals working in a highly dynamic business environment with the educational resources needed to find their way to the top. It was very useful, it added value to my knowledge and it will enhance my career. I enjoyed this experience. It was very educational and hopefully it will be applied in the near future. Great! So glad I found it. Gave me everything I need to do my job properly and with confidence. 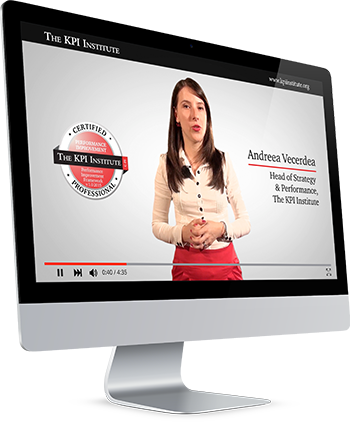 This course is excellent and exceeded my expectations, it updated and expanded my knowledge about the KPIs world. I certainly recommend this course to my colleagues.